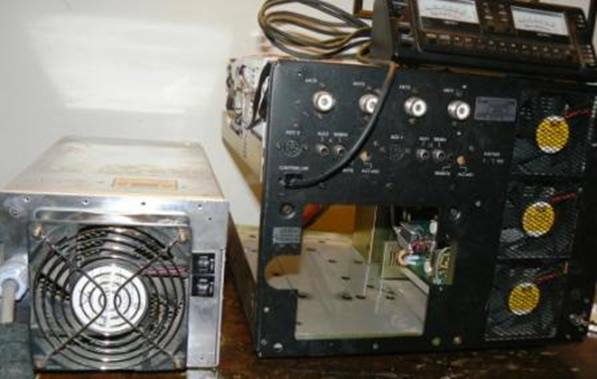 The Icom IC-PW1 amplifier is a great amplifier until the power supply fails. This is a fear of most PW1 owners since replacements run $3122 plus shipping. The good news is that this 2250 watt (45V @ 50A) switch mode power supply can be repaired and made stronger than new. Alternatively, an external 48V power supply can be controlled by the amplifier. 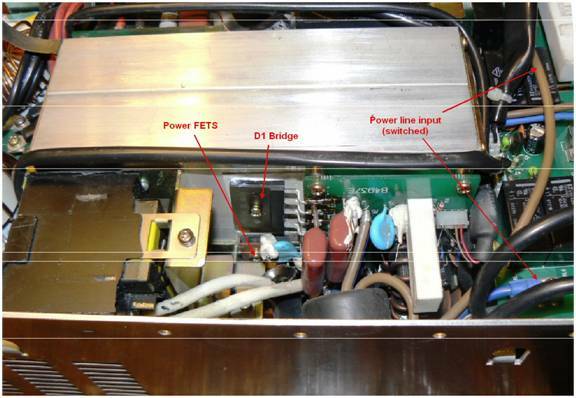 THIS ARTICLE DISCUSSES CIRCUIT REPAIR AROUND LETHAL VOLTAGES. DO NOT PERFORM THIS WORK UNLESS YOU ARE FAMILIAR WITH HIGH VOLTAGE SAFETY PRACTICES. PERFORM AT YOUR OWN RISK. THE AUTHOR IS NOT RESPONSIBLE FOR DAMAGE OR INJURY. AC power from the 220 VAC outlet goes through RFI filter board, fuses, and then to a relay board. So far, there are no semiconductors that are susceptible to power line surges. 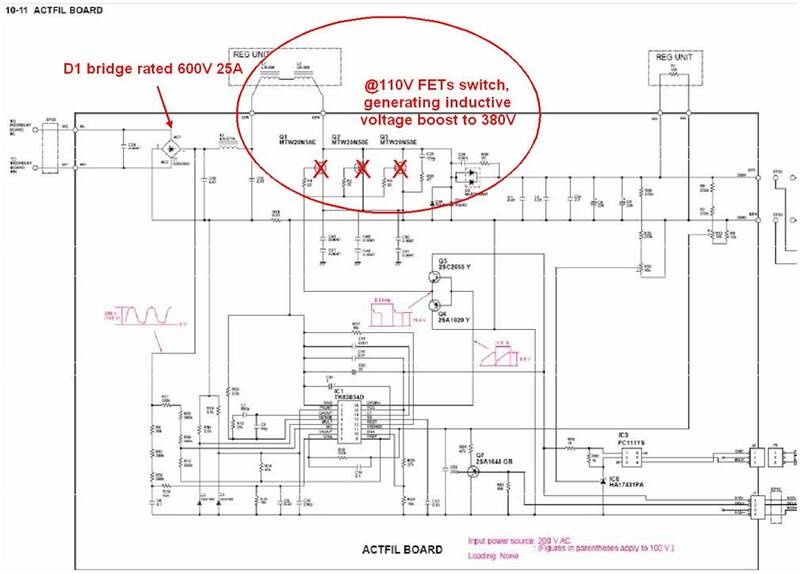 For 45V main power, the AC goes to ACTFIL board where it sees a 600V 25A full wave bridge rectifier, and a FET circuit to boost the voltage when running off 110V. These semiconductors fail in a voltage surge. For the bridge, replace original D25XB60 with D25XB80 (available from Mouser.com). This is an 800V exact replacement. Remove 3 20N50 power FETS from ACTFIL board, since these are only rated for 560V. This legal limit amplifier will now be wired for 220 VAC only, but can withstand surges up to 800V. Removal of power supply assembly requires removal of many Phillips screws. I use a plastic tin to keep them together. Remove screws securing top cover and gently pry cover up. Use caution since there are two wires going to capacitor bank on cover. Disconnect blue and brown wires going to relay board on right side of Figure 3 below. Tape these wires well since they are input for internal 45V supply and will no longer be used. On front of power supply remove red and black wires from terminal strip and DC filter board. These can be reused with external supply. Run well insulated power cable through front grommet to relay board, keeping Line, Neutral, and Ground consistency. Use ring terminals for internal connections and proper receptacle for external power supply plug. This modification retains internal switching regulators, upgrades bridge rectifier and removes vulnerable 110V boost converter. It is not compatible with modification #1. Blue and brown input wires remain connected to relay board. Order diode bridge D25XB80 (available from www.mouser.com). 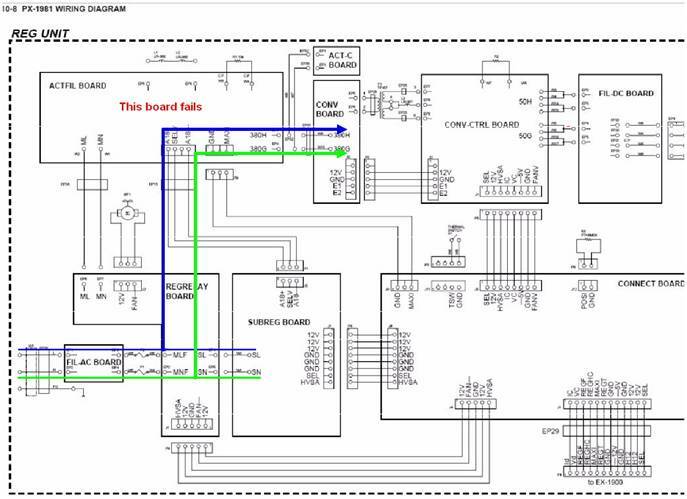 For full access to ACTFIL board, where D1 bridge and FETs are located, remove 4 screws holding heat sink to assembly, and 8 screws holding relay and DC filter boards. This allows electronics to be pulled out. Replace original D1 with new higher voltage part. See D1 location in Figure 3. Three high power FETs 20N50, are located under copper shield. Remove them. This makes this amp 220V only at higher reliability. Check circuit for other opens and shorts according to schematic diagram in figure 5. 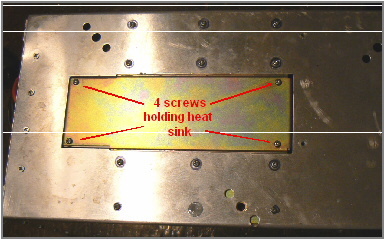 Re-assemble heat sink and circuit boards securely using original screws. I used a Variac to slowly bring the voltage back up. DC output voltage was approximately 28V with 110V input. After final assembly, DC out was 45V from 220 V AC. Perform any additional power supply adjustments (like voltage adjustments, current limiting). Re-assemble and check DC output voltage before connection RF amplifier power wires (red and black) to terminal strip. The 45V supply “should have been protected” from power surges by open relays on the REGRELAY board. How can high voltages be causing damage? I believe the answer lies in how the control circuitry behaves when power is first applied. You see the meter lamps blink and relays switching, even though the power switch is off. Similar behavior occurs during power outages when power is restored. By adding an RC based time delay circuit to the +12V control voltage from power supply to control board, initial power surges can be eliminated. A few seconds should be sufficient for power lines to stabilize before power is applied to control board. In addition, some 220V surge protectors added on input filter board would be a good idea.